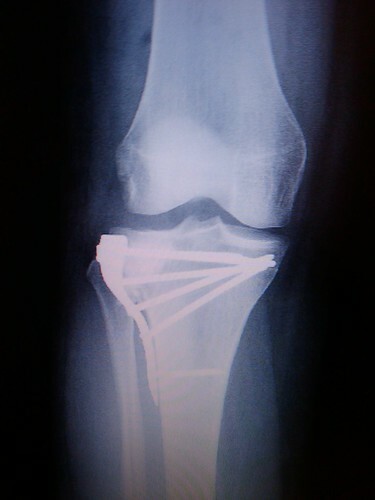 My knee after reduction of a tibial plateau fracture. Healing nicely, but I’ll be on crutches for the next 6-8 weeks. Tibial Plateau Fracture. Right Knee. 56 people in Texas have been hospitalized due to a less than common strain of Salmonellosis. That’s not pleasant. I’ve had Salmonella, and it basically made me want to lie in the bathroom with my burning face pressed against the cool tile underneath me. I lost 8 pounds in a weekend, and had a non-consensual nap in the kitchen floor. I still eat runny eggs though, and can’t imagine not doing so. Salmonella doesn’t kill the healthy, and very rarely kills the immune suppressed. Diarrhea doesn’t scare me, I guess. 56 people have been hospitalized in a state of over 23 million, and I can’t get a raw tomato in any restaurant north of the Rio Grande. A friend called from the parking lot of her favorite taco shop to tell me that she couldn’t get salsa for her chorizo and egg. That’s ridiculous. The illness causing tomatoes are thought to be roma tomatoes not grown in Texas, New Mexico or a long list of other states. Seems it should be easy to bypass those and give me a salad with more than lettuce for lunch. For now I’m carrying tomatoes in my purse and slicing them up with my Leatherman. The clients of Austin Java ( www.austinjava.com ) seemed to find this strange, but understandable. Meat contains three layers of water. There’s free water, which is the stuff running out of the raw meat. There’s intermediate water, loosely bound to the tissue. Lastly, there’s bound moisture which is essentially the water chemically bound tightly to the cell walls of the muscle. This water is unable to exit the meat during cooking. By brining, it is possible to build a salt bridge via a positively charged sodium molecule between the water in the intermediate layer and the water in the bound layer since water has a net negative charge. The end result is the retention of the intermediate layer of moisture within the meat and a nice juicy meal. The salt also adds flavor. I could go on about how the difference in osmolarity between the salt water (high) and the bird (low) causes a migration of salt molecules (and whatever other flavorings you might add) into the meat, but that would just be nerdy of me. This weekend we smoked a chicken I had brined with the solution below. I’ll grant that it was a tad salty because of the additional salt from the pickle juice, but the flavor was fantastic, and this was maybe the juiciest bird I’ve ever made over dry heat. We smoked it on the trusty Big Green Egg, sitting up on a half empty beer can. Before cooking I coated the bird lightly in olive oil, salt, and pepper. I’ve cut the salt back a little in the recipe, so this should be a sure fire brine. It’s what I’ll be using next Thanksgiving…. and I take my Thanksgiving turkey very seriously. Mix dry ingredients in a large stock pot. Add warm water and stir to dissolve. Add cold water. Submerse cleaned bird. Add more water as needed to cover the bird. Refrigerate for at least 12 hours. Note: When brining a turkey, I usually use about 2 cups of kosher salt, dissolve it in a small amount of warm water, then dilute with half cool water, half ice in an ice chest. Then I sink the turkey and add more water to cover. As long as the lid is tight on the cooler, the ice will easily last over night, so I don’t have to find room in the packed fridge. Faux Meat. Sooooo not a recipe. The idea here is that using donor cells from mammalian muscles, scientists could engineer meats (mostly textured products… essentially meat paste) in the laboratory. No living animal need die to provide your chicken nuggets or burgers. Sounds great for those consumers with an ethical problem eating foods created by the death of another being. However, even though we scientists like to tout cell culture as a more humane alternative to animal research, and now animal eating, the process involves the use of a media additive called Fetal Bovine Serum (FBS), or Fetal Calf Serum. This is a damn nasty substance, imho. Essentially cell culturists can’t figure out exactly what nutritive components a cell culture needs to thrive. So we add FBS in concentrations of up to 10% to our media. The serum serves as an undefined media component in which mammalian cells can survive in a culture. The problem with FBS is that it must be obtained from….. Fetal Bovines. When a pregnant cow is slaughtered and eviscerated, the fetus is removed with the other viscera. It is then removed to another portion of the slaughter facility where blood is collected from it’s largest pool, in the usually still beating heart of the fetus. This is done via a freakin’ big needle. There is some debate as to whether or not the fetus can feel or fear at this point, but it’s still a fairly barbaric practice. It is contingent on the slaughter of both cow and calf. Hardly death free meat. Correct? I’m not a vegetarian. Despite my restrictions on the provenience of my food, I believe that humans are intended to consume flesh. I don’t believe however that the conscious consumer deserves the potential bait and switch that “laboratory meat” may turnout to be.